Summer evenings and rainy days! Oh yes, those bring back many memories! Of happy times when we had no care in the world. Of boat rides along the river beside my childhood home, and much later along others halfway across the world! But I have no photos of the former, and have overused images of the latter. 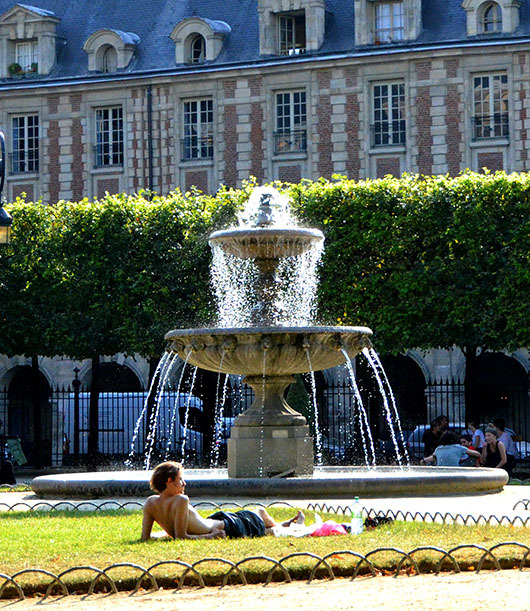 So here is one from the Place des Vosges – a royal square in Paris – that to me evokes carefree summer afternoons, soaking up the sun. Until next time…….happy travels, no matter where life takes you. He looks so carefree that I’d like to go join him! Perfect capture for the challenge, Madhu! Yes, and jumping IN the fountain would be the perfect solution! Are you in Paris now Christine? Now that is carefree !! And lots of other thoughts…….. It says Carefree alright, Madhu! So sorry to hear that Keira. My sympathies. Thank you so much Suzanne. Am a bit tied down at the moment, But I should be able to put something together before the deadline. Thank you Suresh! Appreciate your stopping by to comment. Most welcome Madhu 🙂 Take care! Our plans to see the Taj have been jinxed every time Lynne, so still keeping my fingers crossed! Tha’s what summer’s for. Wonderful interpretation of the theme. I would love to see pictures of you playing along the river as a carefree child, but you have certainly captured ‘carefree’ here in this photo. We can all relate to moments like this. True carefree spirit of summer 🙂 Lovely photo, Madhu. This picture reminds me of sitting on the lawn during college. Oh, to be young again. Lovely isn’t it? There are four such fountains at the four corners of the square. What a perfect example of being carefree. Oh to be able to sit near that fountain and feel it’s water mist upon me. Madhu, I am a sun lover from the shadier side of the street but always a lover of the carefree. Throw in a fountain, paradise! Gorgeous shot! Ahh relaxing in Paris, what heaven! Looks like a perfect place to relax and soak it all in! It is one of the loveliest squares in Paris, and the locals make full use of it. AAAHHHHH!!! A picture perfect snapshot for this theme, Madhu! HAPPY SUMMER TO YOU! Cheers to more carefree moments in the sun! Thanks Zoe. And cheers to more carefree moments in all those wonderful destinations you have been exploring 🙂 Shall be over to catch up with your adventures soon. Although there are many comments already, I still wanted to write that the picture captivated me! It’s easily felt, that feeling, looking at your photo. I can also feel the heat. No bathing in the fountain?